I had thought I might have a virus so I ran PCMatic. It now has come to this screen and I don't know what to do. The reason is because I don't know what the message means. Does it mean that Java is not working? Java is an okay program that runs a lot of other things, from what I understand. Or does it mean a virus that is run by Java is about to be executed? I will write the message below and I hope a PCMatic tech sees this since I am not continuing to do anything until I am sure I do the right thing. Here's the message. 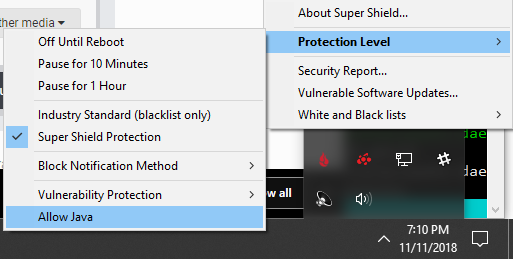 The SuperShield icon is red and Allow and Always Allow are in red as well, so do I hit Always Allow? I'd rather not guess. Please be a tech who knows the answer who can tell me. Thank you. Hello cjj and We block java by default because it's such a large attack surface and is constantly exploited by and for malware. If you need java to run, you'll have to allow it on each machine via right clicking on the green shield in your system tray.